Air is now mixed with natural gas in the Combustion Chambers. The mixture is ignited and an exothermic reaction occurs. In Aghada there is a second Combustion Chamber to make the plant far more environmentally friendly. The resultant hot gases expand rapidly, causing the Gas Turbine to rotate. The combustion of the methane and air leads to an exothermic reaction and the resultant gases expand (1) and thus drive the turbine shaft. As the hot gases exit the turbine (2) the exhaust fumes are captured by the HRSG where they are used to help to drive a Steam Turbine. It is the capturing of the exhaust from the Gas Turbine by the HRSG along with the SEV combustion that makes Aghada such an environmentally friendly power plant with a thermal efficiency of 58.7%. 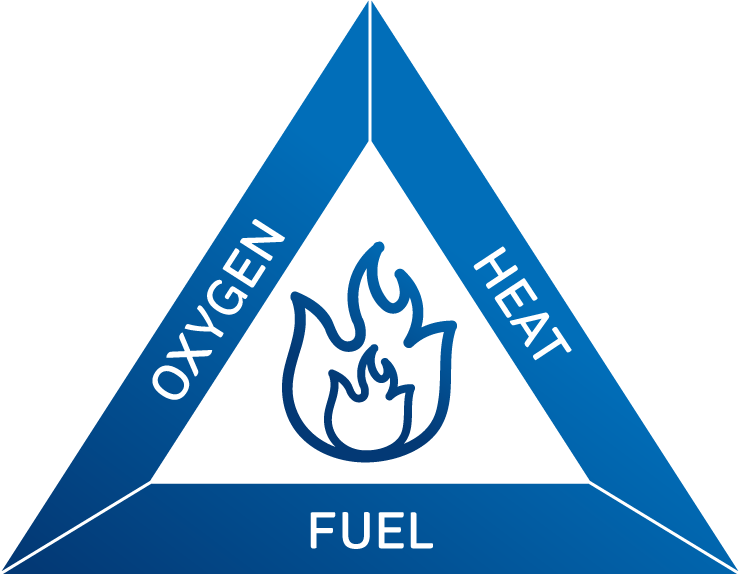 The Fire Triangle has three constituent parts: Fuel, Heat and Oxygen, and we see an example of this within the Combustion Chambers of the Gas Turbine in Aghada. In this case the fuel is methane (a hydrocarbon) the compressed air supplies the oxygen (21% of the air) and the heat comes from the ignitor. Within the Combustion Chamber, methane, which is a hydrocarbon reacts with the oxygen in air to release water and carbon. It is an exothermic reaction thus there is also a release of heat and by extension pressure. 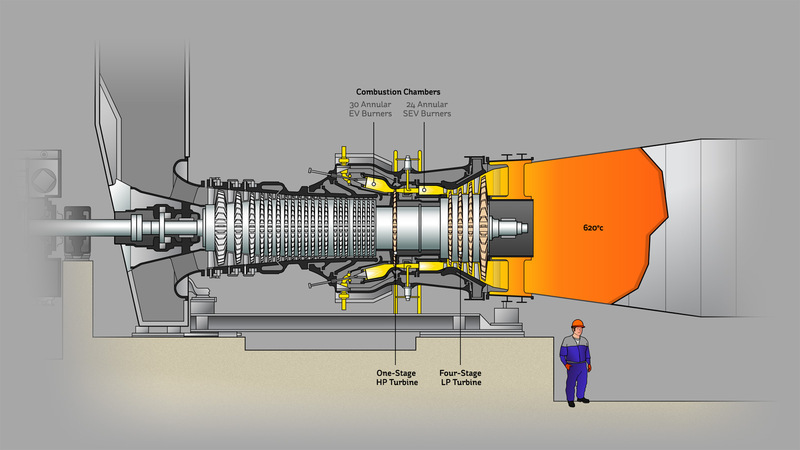 The turbine shaft rotates under the influence of the expanding hot gases. The Generator is coupled to the turbine shaft so it too rotates and the magnetic flux present enduces an EMF.